The Arizona D-Backs (managed by my boyhood hero Kirk Gibson) stay alive in their ALDS series against the Milwaukee Brewers after winning last night's game 8-1 in Phoenix. The hero of the game was Paul Goldschmidt, who hit a grand-slam home run. Despite his Jewish-sounding name, Goldschmidt is not Jewish. D-Backs relief pitcher J.J. Putz, who got the save last night, is also not Jewish even though he has a Yiddish last name (Google it). The Jewish connection in this Milwaukee-Arizona series is that if the D-Backs win again tonight it will force a fifth and final game Friday evening at Miller Park in Milwaukee. 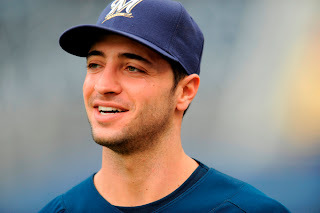 With a 5:00 PM start time, Brewers' star Ryan Braun won't have enough time to get to shul for Kol Nidrei. Braun, whose father is Jewish, has played on Yom Kippur in the past and certainly will should the series extend to Friday night. When I met Braun a few years ago (coincidentally in Phoenix), he told me that he never took his Judaism very seriously, but that he is proud to be Jewish. Braun's interesting connection to Detroit Tigers Hall of Famer Hank Greenberg is that he lived in his grandfather's home for a time during his childhood in the house that once belonged to Hank Greenberg. While I'll be cheering for Kirk Gibson's team in this series (another favorite player from my youth, Alan Trammell, is the D-Backs' bench coach), I'll also be hoping that the Brewers win tonight so Ryan Braun will be able to take Friday night off -- whether he goes to synagogue for Kol Nidrei or not. While I'm already writing about baseball and Judaism, why not mention that this baseball season marks the 60th anniversary since a first in Major League Baseball. On May 2, 1951 at Briggs Stadium in Detroit (what later became Tiger Stadium), Philadelphia A's pinch hitter Lou Limmer stepped into the batters box to face the Tigers' Saul Rogovin who pitched the ball to Tigers' catcher Joe Ginsberg. Limmer's pinch hit home run of course made it into the box score for perpetuity, but what the box score for that at-bat doesn't mention is that it was the only time in Major League Baseball that the pitcher, the catcher, and the hitter were all Jewish.